This is a relatively easy, circular route, and by Yorkshire standards pretty flat. There's no better pub at which to start a cycle ride than Ye Old Sun Inn in the village Colton, because around the back it's got a fabulous deli selling pies, homemade cakes, traditional lemonade and other treats to fortify you for your journey. It's an easy cycle to your next stop by the river Ouse, where the Ship Inn was a popular stop for bargemen on their way to York in days of yore. Moving on, you'll be ready for tea at the rather wonderful D'Oyly's tearoom in the village of Copmansthorpe, before completing your journey back at Colton, where the Sun should now be ready to serve you a well-earned pint. It's a steady climb out of the village of Kirby Malzeard and up to the pretty next village of Laverton, where you might want to take a break with the ducks on the village green before climbing further to the Drovers' Inn in Dallowgill – one of the more feted Yorkshire Moors pubs, an old-fashioned place with barely more than room for more than half a dozen locals in what feels like someone's front room. Fortified with a pint, it's a beautiful ride from here through an almost forgotten valley and then up onto open moorland before the descent back down into Kirkby Malzeard. This is another route that has a wonderful pub at the beginning – the Blue Lion, an ancient and barely changed place in many respects, but one that is bang up-to-date when it comes to food, which is delicious and definitely of the 21st-century variety. Stage 1 of the Tour passes through East Witton, and within a few minutes you're pootling over a stone bridge barely wide enough to fit a car, before heading uphill to a plateau of ploughed fields and after a while a brilliant stop at Jervaulx Farm, where they make their own ice cream and serve it in their own café. Assuming you're not tempted to work your way through all 35 varieties, it's a short ride from here to the peaceful ruins of Jervaulx Abbey, before a short cycle back into East Witton and the delights of the Blue Lion's 21st-century menu. A short ride, but a relatively steep one, which should give you a bit of empathy with the gut-wrenching climbs the Tour riders have to undertake. Start at West Witton, which nestles in the bosom of Wensleydale, before taking on the ascent of the aptly named Witton Steeps, which leaves you up on Melmerby Moor looking down at the valley below, and on what must be one of the least travelled roads in England, stretching for miles across nothing but heather-clad moors. Drop down after a bit to Melmerby itself, and then Carlton at the base of the valley, where you can re-fuel at the Foresters Arms before heading along the valley and then steadily up again over Middleham High Moor as far as the top of Witton Steeps – which this time you get to enjoy in reverse! This route is all laid out along the valley of the river Bain, and takes you through James Herrriot country, passing through the village of Askrigg where the TV series All Creatures Great and Small was filmed. Up above here the Dales scenery is wonderful, and gets even better as you freewheel it down to popular Aysgarth Falls, which Tour also passes through on day 1. Stop off here for a bit to eat at the Mill Race tea shop, before cycling back along the same valley back to Bainbridge. 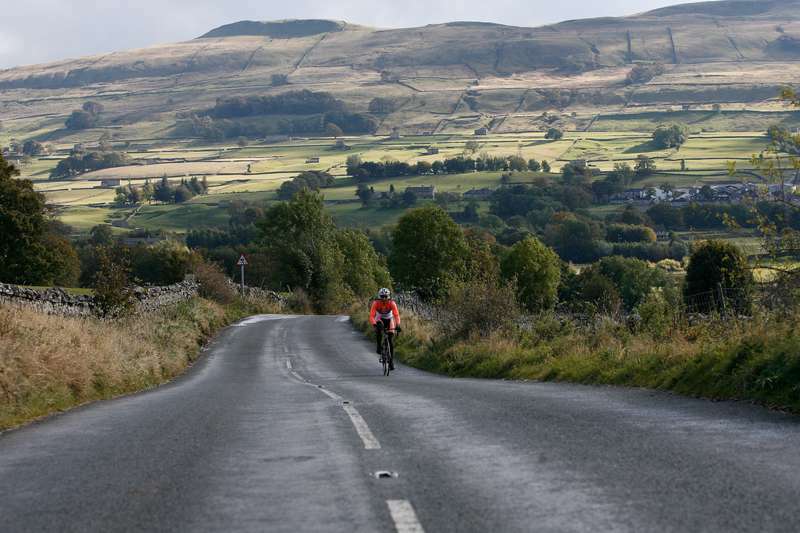 A lovely ride, enjoying some classic Yorkshire Dales scenery. This ride takes you from lakeside to riverside with some stunning scenery in between. Brompton Lakes is a wildlife magnet, from where you head off on country lanes to Gilling West, where there's a perfectly placed pitstop in the form of the White Swan pub. There's nothing too demanding beyond here, and before very long you're dropping down into the elegant town of Richmond, another good place to stop to have a mooch around before getting back in saddle again for a ride on an off-road path to the ruins of Easby Abbey, after which it's just another mile or so back to Brompton.